You see it as you go down the aisles of Walmart, Costco or any department store or supermarket: Customers with one hand on their cart and the other on their smartphone, price-comparison shopping and looking for deals. Such customers spend an average of 16.9 hours a week on their phones, a new study shows. 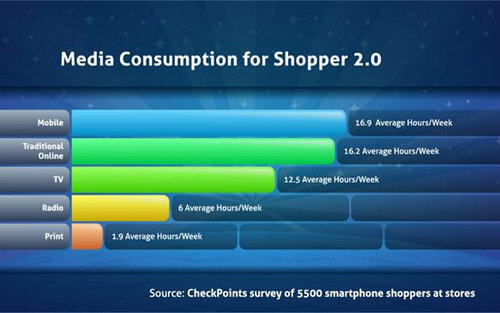 CheckPoints, which shared the results, calls this customer “Shopper 2.0,” and says this person spends more time using their smartphone than they do “traditional computers” (16.2 hours a week), a kind of tipping point in favor of smartphones. The gap will only continue to widen in favor of smartphones as more people buy them.